On the 2nd day of September, 04 Chris Meyer and myself received an email from LA Film School Theater Manager, Andy Schrader that said in part; "...due to the sudden growth in the LA Film School's student population, the LAFS is going out of the theater rental business effective December, 04." Two days later we got another email apologizing for the previous email and revising the December, O4 date to "effective Oct, 04." 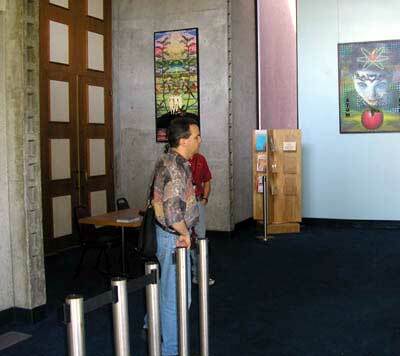 Several months prior to that, actually very early in 2004, I had this grand notion of finding a smaller space for more "focused" lafcpug meetings in addition to the monthly meetings. By focused I mean, special events for FCP beginners only, and events that cover one particular aspect of working with FCP or digital filmmaking. That, and maybe a quarterly lafcpug filmfest or screenings of lafcpug members work. I didn't really know. I just wanted to have another space for smaller more focused events. So I began looking. The LA Film School, although ideal for our monthly meetings was much too expensive for lafcpug to even consider. LA, as all of us who live here know, is not an inexpensive place to live and play. The same holds true all over this country but here, it is just to the left of "insane." This was particularly true as I began looking around for a suitable venue that would meet our requirements. The place had to be comfortable, reside in a safe and central location, seat at least 200, have parking nearby, have digital projection and screen and audio in place, not be in a College or University, and be affordable. Yeah, right. A couple months of discouragement later, fate intervened with the sudden death of a friend of mine. His memorial service was to be held at this place called the Gallery Theater in East Hollywood - or Little Thailand - or Little Armenia, or whatever it's called now. Anyway, I'd never heard of the place. The Gallery Theater, as it turned out is a newly renovated 290+ seat theater owned by the City of LA and housed on the grounds of the Barnsdall Art Park on a hill overlooking the city. 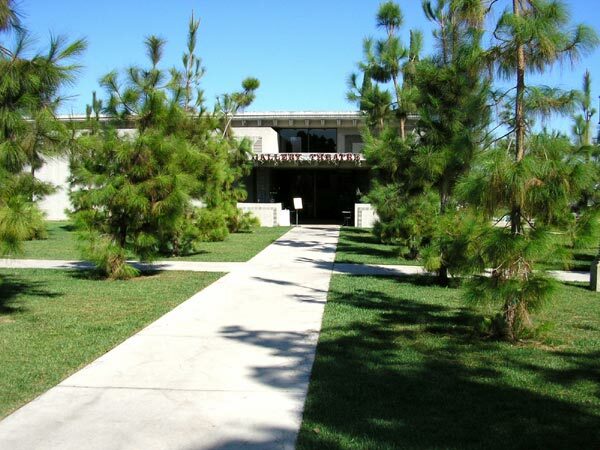 It's the place that houses Frank Lloyd Wright's Hollyhock House. 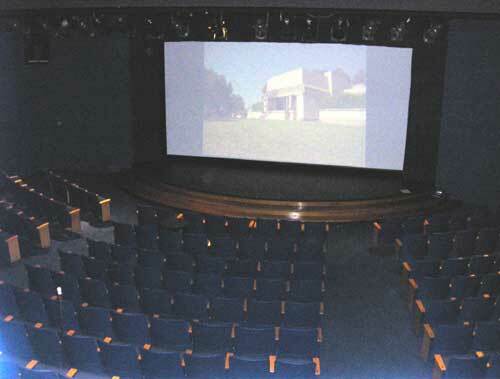 The theater has been primarily used for educational and children's programs, plays, city council meetings, and most often for music concerts. It has a very nice 12'x25' (20' diagonal) screen, good acoustics, and despite it seating 290+ people, is very intimate in feel and size. The place was damn near perfect. Except for one thing; or should I say a whole lot of things. 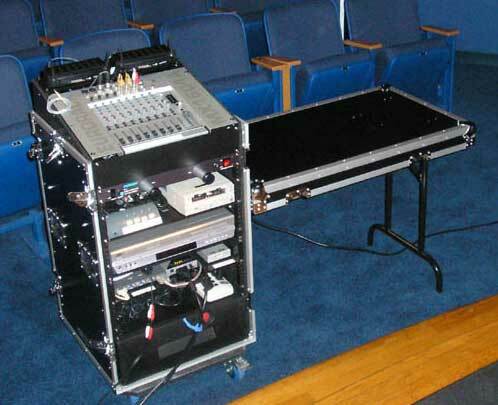 It didn't have the equipment we needed to make it suitable for meetings or screenings. No wait, it did have a screen and it did have a projector, but the projector was this ancient Barco the size of a baby elephant with a lens the size of a missile launcher. And it would only support a resolution of 800x600. So... I forgot about the place. Until one day in May, Chris Meyer of MGLA (who's group also meets at the LA Film School) and I got to talking about 'things' and Chris mentioned wanting to move MGLA out of the LA Film School to a more "cozy, inspirational space." I mentioned I had found this Gallery Theater place but it had no equipment. Not to be denied, Chris had some ideas that just might make this place work. Great! So Chris, his wife Trish and myself made a date to go visit the Gallery Theater shortly thereafter. 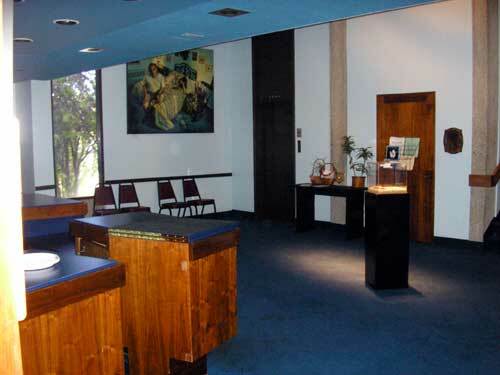 If there is one thing about the Gallery Theater and its surroundings, is that it IS inspirational. Chris and Trish both loved the place as soon as they saw it. Trish seemed to be more excited about the butterfly possibilities as the park lies on a high hill and butterflies love high hills, but I could see the "wheels" in Chris's head begin to turn furiously. Of course I, being the Irish cynic that I am, kept reminding them that there was no equipment. This didn't seem to be a problem to Chris, but it was to me. So while he conferred with Tom Albany, the theater manager, Trish and I talked about the mating habits of butterflies. I learned a lot about butterflies that day. The next day Chris sent me an email with a list of equipment we would need to make this place work and ideas where to get it and from whom. Total retail cost was about $30-40,000. What, was he nuts? I just wanted rent a place to meet every once in awhile, not buy it. The biggest and most costly item we needed was a digital projector. The LA Film School had just purchased a JVC 2K Digital Cinema projector that lists for about $225,000, and not being the "gear head" that some folks are, I figured a good projector was going to cost a whole bunch of money. Well, a good projector does cost a whole bunch of money, but not as much as I thought. In fact a LOT less than I thought. It was, I believe, this exact moment that I began to think that maybe indeed we can make this happen. The wheels in MY head began to turn furiously. Not only could this place be another venue for lafcpug but we could build the first affordable mid size Digital Cinema in Los Angeles. I began to get a little excited about all this. I had a VERY enthusiastic partner in Chris Meyer who was putting in a great deal of work, so why not ride the tide of enthusiasm and see where it takes us. So over the summer months, (yes that's 3 months) we went begging for the equipment necessary to build a Digital Cinema. We used what Chris called "The Seven Corvettes Approach." whereby you beg for seven Corvettes in the hopes someone will give you one. We both wrote hundreds of e-mails, (many to each other) and made dozens of calls to dozens of companies, all the while revising the list of equipment needs, revising our plan for the theater, and eventually as time went by and frustration grew, changing "Plan A" to Plan B." Plan A was that we get all the equipment and install it by no later than the first week of September, 04. Plan B was to get all the equipment and install it before we die. It was now September 04 so we were in Plan B mode, that is until the email from Andy Schrader arrived in our mailboxes. "Ok, don't panic!" I yelled to myself. I'm not losing this group after 4 and 1/2 years because of a little thing like losing our meeting space. We just move to Plan C, whatever that is. So we once again contacted all of the companies we had contacted before and once again pleaded our case, only this time a bit different. This was no longer just about helping lafcpug and MGLA find a meeting place. I mean, who the hell are we? What's in it for them? What are they going to get out of this? No wonder I didn't get very far over the summer. I was "selling" this thing wrong. There was no reason for anyone to listen. With the loss of the LA Film School to the public, this was now about replacing that lost venue with another, only this time, an affordable one. A Digital Cinema that the entire digital filmmaking community could use. This time we would promise to place the companies name on a plaque and hang that plaque in front of the theater. We would also promise to place the companies banner on the "next meeting" pages of our respective web sites. We still stuck with the Seven Corvettes approach, but this time most of them listened. Chris revised the "equipment list" once again and support began to trickle in. And over the next month just about everything on that final revised list was delivered. Oh sure, there were very big bumps and hurdles and moments of high anxiety, but when faced with a deadline, you just seem to figure out a way to jump over them. And, so we did. Although he would complain about frequent "sleepless nights," and increased blood pressure, Chris Meyer was now in his element I am sure. He had all this wonderful equipment laid out before him and now the task was to figure out how to wire it all together, not only so it would work, but so it would work with idiots like me who would have to use it. Lets face it, this is what 'Gear Heads' live for. 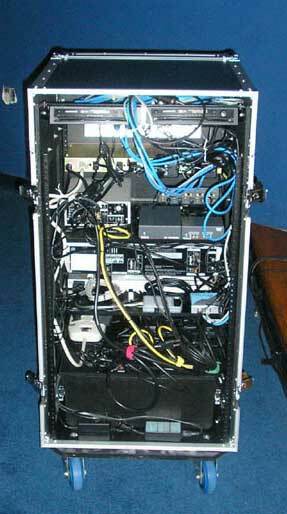 Chris created a masterpiece of creative engineering in one self contained unit he dubbed "The Rack." If there is one reason to make it to the meetings it is to marvel at "The Rack." This past week, Chris and I and the Gallery Theater's Tom Albany installed everything needed to create a Digital Cinema and our future home. That process is described below, and includes thanks to all the Companies and individuals who helped make this happen. And, I am happy to say, the installation went beautifully and the result is magnificent. Welcome to lafcpug's and MGLA's new home, and LA's first affordable mid size Digital Cinema. We hope you like it, because we sure do. The following was sent out to the MGLA Mailing list on Nov 11, 2004 and is published here with permission and is unedited . Yesterday we finished upgrading MGLA's new home - Barnsdall Gallery Theater ("BGT" for short) - to become a digital cinema showcase. We wanted to share some of the details with you because, for one, we know some of you are gearheads who would be interested <smile>, and also because the numerous companies who came together to make this happen deserve recognition for their commitment to the desktop media production community (that's you!). Earlier this year, both MGLA and LAFCPUG began looking for an alternate meeting place. The status of LA Film School was uncertain, and M GLA in particular was looking for a more cozy, inspirational space akin to what we had at AFI. Michael Horton of LAFCPUG found BGT: a recently renovated 290+ seat theater that is part of the Barnsdall Art Park complex, which includes a gallery, the Junior Arts Center, and the Frank Lloyd Wright Hollyhock House. Lovely room - but all it had was a 16mm film projector, an ancient Barco digital projector, and no way to get video or computer signals from the stage to the projection booth. Being a city-owned property, there was no budget for them to make these upgrades themselves, so we had to go about putting together a system (and the donations to realize it) ourselves. The heart of the new system is a Sanyo XF35NL digital projector (6500 lumens, native XGA, hi-def compatible). Sanyo made the projector and lens available at cost (facilitated by VTP Corp. and Hollywood Studio Rentals); Apple Computer very generously funded its purchase - they deserve a big hand for coming through in a big way. 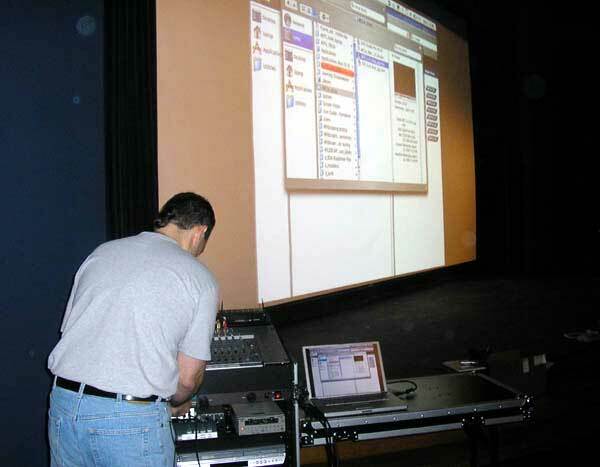 Then came interfacing with the projector from the stage. The major funds for this part of the job was provided by dvGarage / Pixel Corps with additional help from several other companies. Whenever we had a choice to make, we took the one that would yield a higher quality picture. For example, the computer link is via DVI, rather than VGA. Gefen Systems are the kings of this particular world, and made their interface boxes available to us at a deep discount. 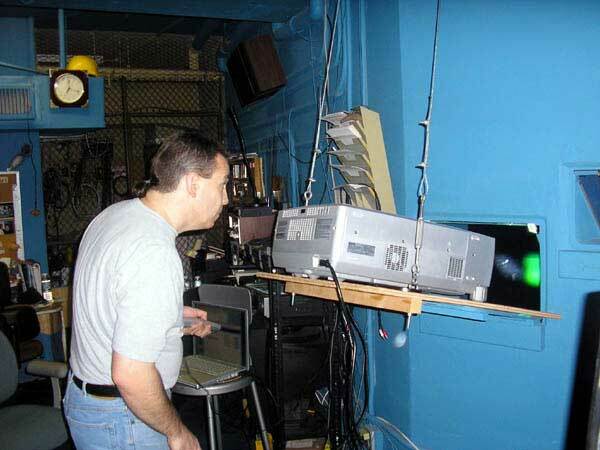 We are using their equipment to send the DVI signal over dual ethernet lines from the stage to the booth (a 125' run! ), and can project 1024x768, 1280x1024, and 1600x1200. We are also using their VGA to DVI converter (to support older computers, at 1024x768 resolution) and DVI to VGA converter (to display the signal on a local VGA monitor - a Viewsonic G220FB 21" CRT). Additionally, LAFCPUG and Intelligent Assistance provided a VGA splitter and scan converter, allowing us to record the computer screen output. Expect this to be used on LAFCPUG DVDs; dvGarage/Pixel Corps is looking into webcasting MGLA meetings in the future. The same philosophy holds true for analog video: We're sending s-video (Y/C), instead of composite, to the projector (no more ugly dot crawl on DVDs and demo reels!). Decks at the stage include a Sony DSR-11 (DVCAM and miniDV formats) and JVC HRXVS44U (DVD, VHS, and S-VHS formats). We are using Extron boxes to convert between composite and s-video to support external decks, and also to boost the s-video signal to run 125' to the booth. Local video monitoring for cueing is provided by a Sony PVM14L1. ProMax Systems donated the DSR-11 (as well as the wireless mics we use), and made the Viewsonic and Sony monitors available at cost. There is additional icing on the cake, of course. Everything is loaded into an Odyssey slant rack (funded - along with other odds and ends - by Adobe Systems; we have a Behringer MX1604A audio mixer (to provide full mixdown for the scan converter et al); in addition to our current Samson wireless mics, BIAS Inc. purchased additional Sennheiser wired mics for us; a Furman PL-8 provides both filtered power as well as lights for the rack (no more fumbling around for the deck controls in the dark), etc. Most of the cables - as well as the custom patch panels at the front of the theater - were purchased through Markertek, who were extremely helpful. MGLA and LAFCPUG also kicked in some additional items, such as mic stands. MGLA co-host Chris Meyer spec'd and wired together the whole rig, and tested it at CyberMotion before today's install - which ran smoothly, we're happy to say. In the future, we look to have internet access at the stage as well, which will be an additional boost for our presentations. This equipment is all on extended loan to BGT, who will be using it for other digital media events, user group meetings, and seminars (including school events). BGT is a non-profit, and the theater is available for rent at a price that is 1/2 to 1/4 that of comparable spaces around town. The generous donations of all the companies above allows them to provide all sorts of new capabilities while maintaining low prices for groups such as ours, as well as artists wanting to show their work. We feel the end result goes beyond just giving us a place to meet - it's a community resource. We apologize for this long email, but it has been a nerve-wracking several months to pull all this together, and we wanted to share our happiness with the outcome with the rest of you. We look forward to seeing you at the MGLA meeting next week, and throughout 2005. Enjoy!